Otzma Yehudit activists ex-MK Dr. Michael Ben-Ari and Attorney Itamar Ben-Gvir responded on Thursday afternoon to reports in Haaretz that actor Oded Kotler left his home in Tel Aviv on Tuesday, on police recommendation, ahead of their symbolic protest there. 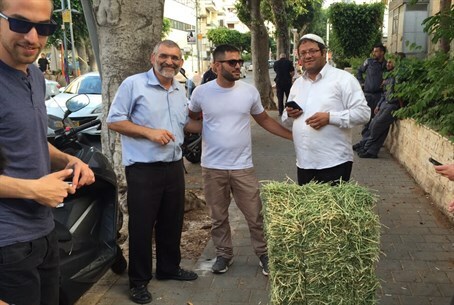 A group of Otzma Yehudit activists, led by Ben-Ari, Ben-Gvir and coordinator Yossi Davidov, held a comical protest outside Kotler's home by bringing a bale of hay and handing out free fresh straw, in response to Kotler's offensive statements at an artists rally on Sunday when he called Likud voters, and by extension all nationalists, "straw-chewing beasts." Ben-Ari said that if the reports are true and Kotler was told not to be at home during the protest, "the police are turning the attacker into the victim." "The one who harmfully and uninhibitedly disparaged a wide segment of the public was Kotler, who suddenly has turned from attacker to victim," emphasized the former MK. The leftist Haaretz did not say when and if Kotler had returned home, apparently indicating that he was still avoiding his house out of fear of confrontation. Ben-Gvir colorfully pointed out, "it's too bad that the Israeli police are frightening Kotler - in my opinion exposure to a democratic protest in front of his home is a very important thing." "Kotler is a very racist and very unenlightened man - pluralistic protests under his house will only do him good," added the attorney. In his offensive remarks on Sunday, Kotler had said that the ruling party Likud is "followed by a marching herd of beasts chewing straw and stubble," in a dehumanizing and insulting criticism of nationalist voters.